More often at work you need to combine multiple PDF files and send it to your client or boss as single file. Binding of multiple PDF files would be necessary when you need to combine multiple reports from different team members and make a single team report, or when you need to stitch multiple split PDF files. 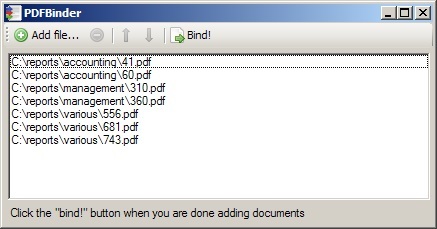 The software which helps you do the PDF merging and combining is PDF Binder. PDFBinder is a very simple software that lets you combine and merge any number of PDF documents into one. PDF Binder works only for windows. Download PDF Binder free. You got to push it-this esnaetisl info that is!